ساسمونگ گلکسی نوت جدید خود را با نام Samsung Galaxy Note 10.1 2014 Edition در کره عرضه نموده است. مدل LTE-A دارای سی پی یو 2.3 گیگاهرتزی کوادکور و مدل Wi-Fi-only دارای پردازنده 1.9 گیگاهرتزی اگزینوس 5 اکتا خواهد بود. با صفحه ی نمایش 10.1 اینچی AMOLED قدرتمند با رزولوشن 2560*1600 و اندروید 4.3 یک تبلت عالی محسوب میشود. هر دو مدل 3 گیگابایت رم و مجهز به دوربین 8 مگاپیکسل خواهند بود. این محصول به همراه قلم S بهبودیافته و همچنین باطری 8220 میلی آمپر ساعت عرضه می شود. مدل LTE-A ورژن در کره جنوبی هم اکنون 894 دلار و مدل Wi-Fi به قیمت 754 دلار و فقط در رنگ سفید کلاسیک به خریداران عرضه میشود. 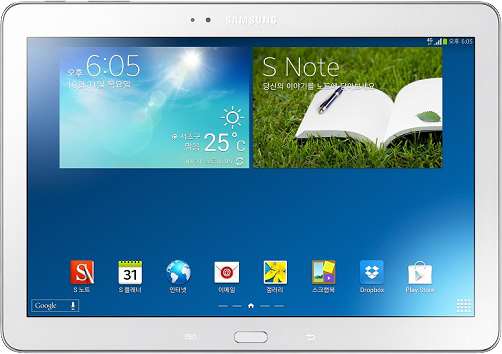 Samsung is rolling out its Galaxy Note 10.1 2014 Edition to South Korea as well. The tech giant has been in the process of releasing the slate across several markets and the South Korean one is the latest to get it. Customers in the country will be able to grab two variants – the LTE-A one and the Wi-Fi-only one. The LTE-A model is probably going to be powered by a 2.3GHz quad-core processor that most likely translates into a Snapdragon 800 processor. With the Wi-Fi variant Samsung will offer a 1.9GHz Exynos 5 Octa chip. The slate features a 10.1-inch AMOLED display with a powerful 2560 x 1600 resolution, and is shipped with the Android 4.3 operating system on board. Design-wise, users will probably notice the same premium finish as we have seen with The Galaxy Note 10.1 2014. 3GB of RAM will be offered for both models and an 8-megapixel camera. Samsung also brings the improved S Pen featuring Air Command. Life power is provided by the 8220mAh battery. South Korean customers can grab the Galaxy Note 10.1 2014 Edition LTE-A version for KRW 946,000 / $894 / €651 while the Wi-Fi variant sells for KRW 799,000 / $754 / €549. The slate is only available in classic white.